Monaco Investments Partnership’s request to rezone lands on Prince Albert Rd. 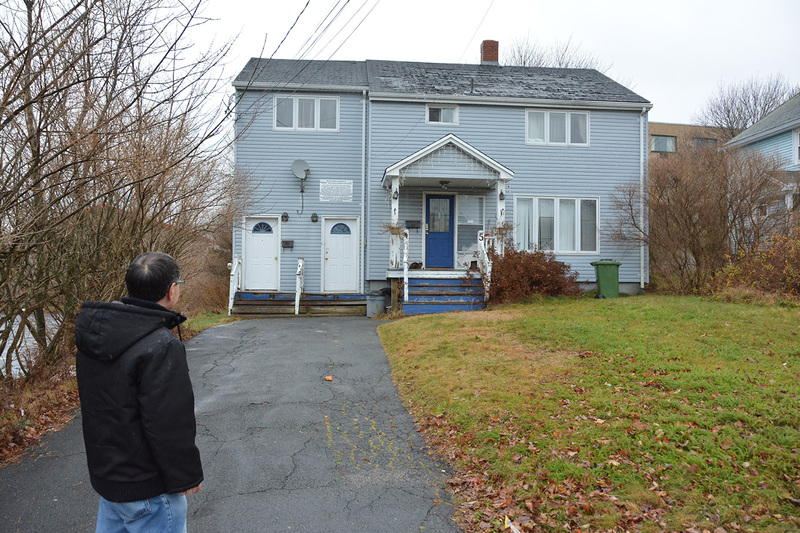 and Glenwood Ave. in order to build a nine-story building with up to 90 residential units is not sitting well with Dartmouth resident Paul Mombourquette, whose home happens to be situated next door to one of the proposed development sites. “The proposed nine story apartment (would be) totally incompatible with the nature of our neighbourhood,” he says. Mombourquette has lived in the same house on Glenwood Ave. for more than 50 years. He says that around seven years ago, when developers purchased properties surrounding his, they approached him and asked if they could buy his house too. “I love this neighbourhood, and am so strongly rooted in the community so I didn’t sell,” he says. However, Mombourquette’s choice to stay would end up bringing him and his late wife a whole host of unforeseeable problems, beginning with Monaco Investments’ intent to build a high-rise apartment on the property next door to his. 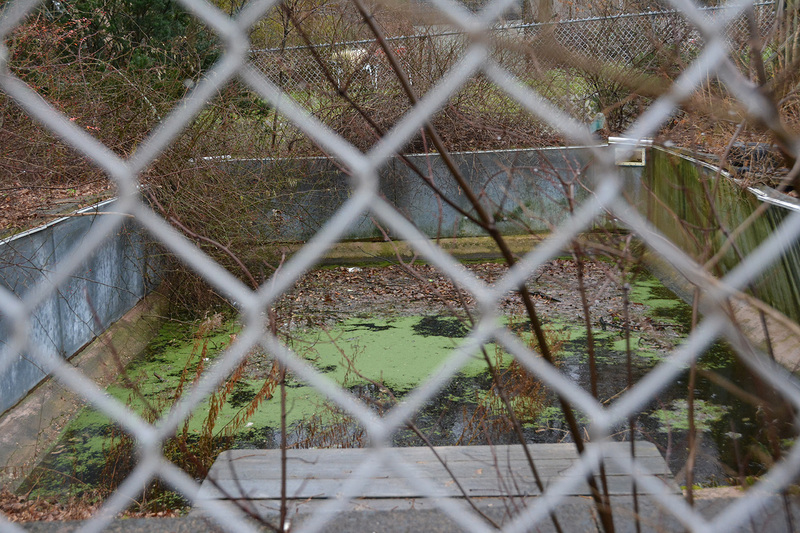 Green sludge in a swimming pool seen through the fence from Mombourquette’s backyard into 5 Glenwood Ave., which has deteriorated so much it has become a danger to the neighbourhood since purchased by Monaco Investments seven years ago. In 2011, Monaco Investments submitted a rezoning and development agreement proposal, asking to build a 15-story, high-rise building with a maximum of 92 units at the corner of Prince Albert Rd. and Glenwood Ave. After going through the review process, the proposal ended up being rejected by the Harbour East Community Council in Oct. 2012. Upset by this decision, Tony Maskine, one of the three owners of Monaco Investments Partnership, filed an appeal with the Nova Scotia Utility And Review Board (NSUARB), claiming that “the community council did not fulfil its obligation to reasonably carry out the intention of the municipal planning strategy,” he told The Chronicle Herald at the time. “The developers have gotten screwed around here forever,” he said to the Herald. However, the NSUARB then dismissed Maskine’s appeal, siding with the Community Council decision. Yet Maskine and the folks behind Monaco Investments were not going to give up so easily. On Dec. 2015, a few years later, they submitted another rezoning and development agreement proposal for that same intersection at Prince Albert Rd. and Glenwood Ave. This time, they were proposing a building with nine storeys instead of 15 and a maximum of 90 units instead of 92 units. They were also proposing an underground parking lot with a minimum of 106 parking spots and that the ground floor of the building be used for commercial purposes. In order to be in line with the Dartmouth Land Use Bylaws, they were also asking to rezone the lands at 5 Glenwood Ave from two-family to multi-family, high density residential and the lands at 307 Prince Albert Rd. from general business to general commercial. 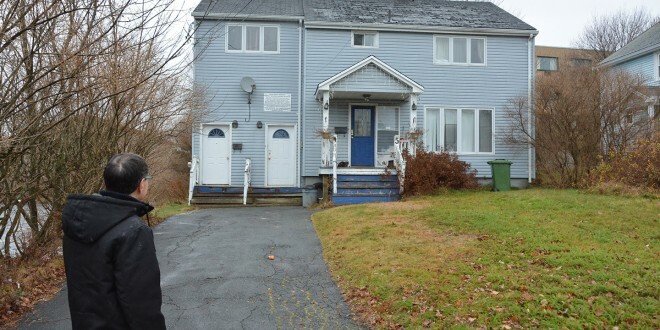 5 Glenwood Ave., which has deteriorated so much it has become a danger to the neighbourhood since purchased by Monaco Investments seven years ago. “There’s no way that my wife and I should have had to go through this again, as well as all the other members in the community, after this other building was turned down five years ago,” Mombourquette says. The intersection of Glenwood Ave. and Prince Albert Rd. already has high amounts of traffic and frequent accidents without a high-density, high-rise apartment building on that corner. “I don’t know (how) even with that in mind, the planning department still recommended this building again, after it had been defeated,” he says. Mombourquette also is concerned about the limited parking spaces proposed in the plan for the building, especially since there would be no designated external parking. He and his neighbours fear that an increase of traffic on Glenwood Ave—a street with no sidewalks on it— would be dangerous for pedestrians and especially children, who walk to and from school on that street. “I’m very, very worried about the parking on Glenwood and the safety of the children,” he says. The threat of this proposed development continues to be a burden in more ways than one for those living in that neighbourhood. Proposed 9-story development on Prince Albert Road. and Glenwood Avenue. “The developer has owned the property (at 5 Glenwood Ave.) for about seven years and he has let it deteriorate to the condition now where it’s actually dangerous,” he says. At 5 Glenwood, there is an old swimming pool that now has dead rodents floating in it (giving off a strong stench according to Mombourquette) and rotting overgrown vegetation entering into Mombourquette’s backyard. 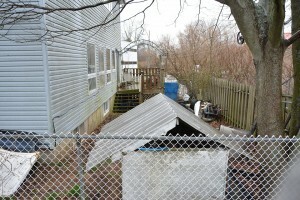 There is also a hole in the fence to the property that children from the neighbourhood have begun to use to gain access to the property. Not only this, the building on the property has been completely neglected as well, making it a hazard for Momborquette every time there’s a storm. In the end, Mombourquette feels that the lands next door to him should not be allowed to be re-zoned for this proposed development. 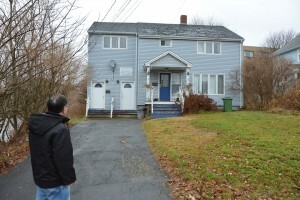 Mombourquette stands in front of the deteriorating property next door to him at 5 Glenwood Ave, which is part of the proposed development by Monaco Investments. The staff report on the proposal recommends accepting the rezoning and development agreements, but with some caveats, such as including “an approximate 6-metre landscaped buffer” between the proposed building and Mombourquette’s house. To Mombourquette, having a building that is three to four storeys high is still problematic, especially because it will still be far too close to his house. 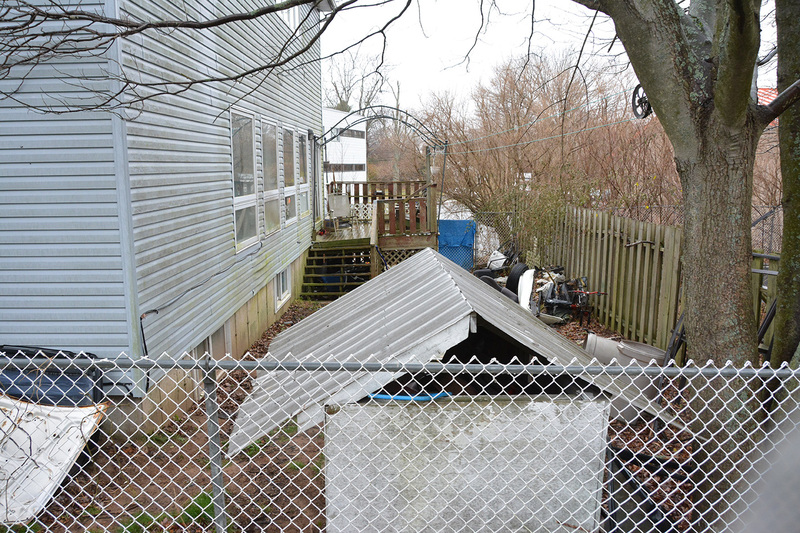 Currently, a four-storey motel abuts his property on one side on his backyard, which he says has seriously impacted his privacy in his backyard in a negative way, and fears it would be “totally destroyed” if the proposed building is built. “There’s no way he should be able to rezone that and tear down an existing house here, right next to me, that has provided a buffer for my family and I for 52 years since we’ve been here. It feels like you’ve had the rug pulled right out from under you,” he says. He also worries for how homeowners in the area who will potentially see a drop in their property values as a result of this development being built. Whether or not this proposal will be endorsed by Harbour East Community Council remains to be seen, however. As per due process, the proposal will be open to a public hearing on Thurs. Dec. 7, 2017 at 6 o’clock at the Harbour East-Marine Drive Community Council Meeting Space. Rebecca Hussman is a freelance writer and photographer based in Halifax, NS. Follow her on Twitter and Instagram @hussmanr and view more of her work at http://rebeccahussman.com. 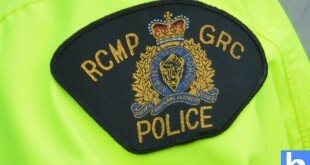 Update: RCMP respond to motor vehicle collision on Highway 101, Windsor, N.S. 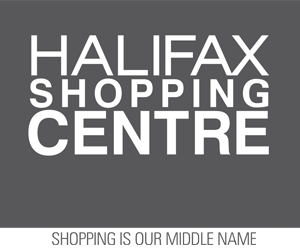 Win a spring cleaning package!